Boasting spectacular views of the Atlantic Ocean, this 3-bedroomoceanside townhome provides everything you need for the perfect Outer Banksvacation. 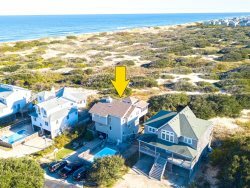 Take a few short steps across the beach road to the sand dunes, where youll find private crossover walkways available only to guests of the Sea Dunes rental community. Spend the day soaking up the sun, surf and sand at the life-guarded beach access, where you can kick back and relax while you make the most of your stay. Sip your coffee while you sway in the porch swing on the lower deck, or work on your tan while you sun yourself on the top-level deck that features a table and four chairsas well as two lay-back loungers for ample seating. Get up early and head out on the deck, where you will witness amazing sunrises over the ocean. Just dont forget your camera! This well-decorated townhome is an end unit, so youll enjoy peace and quiet on your escape to the beachnot to mention exceptional views from your two private balconies. Two master bedrooms on the mid-level offer a spacious retreat and plenty of privacy, and a top-level bedroom complete with a pyramid bunk and twin bed provide lots of room for the kids in the family. Feel like taking a ride along the beach road or nearby quiet side streets to get your daily dose of exercise? SDI1 provides several bikes, which are stored in the secure garage area on the lower level. An assortment of beach chairs are also provided for your ultimate conveniencesimply grab one from the garage and hit the beach for the day! Located within the Sea Dunes rental community, SDI1 offers free access to a wide array of community amenities, including a swimming pool, hot tub, tennis courts, basketball courts and a volleyball court, as well as a pool table and air hockey tables in the nearby community clubhouse. Youll also have access to an exercise room, picnic area with gazebos and free wireless internet access in the clubhouse and your unit! Ground Level: Garage and inside shower. Mid level: 2 master bedrooms, both with Queen beds, one with a jacuzzi tub and steam shower. Top Level: Bedroom with Pyramid Bunk and Twin, kitchen, living area with Queen Sleeper Sofa, half bath and ocean view deck.